Thirty years after the 1932 publication of Brave New World, Huxley wrote a nonfiction follow-up to the novel called Brave New World Revisited in which he made connections between social and technological trends and the world envisioned in the novel. I recommend buying an edition that contains both works. Several resources for comparing and contrasting Brave New World and 1984 are linked here. 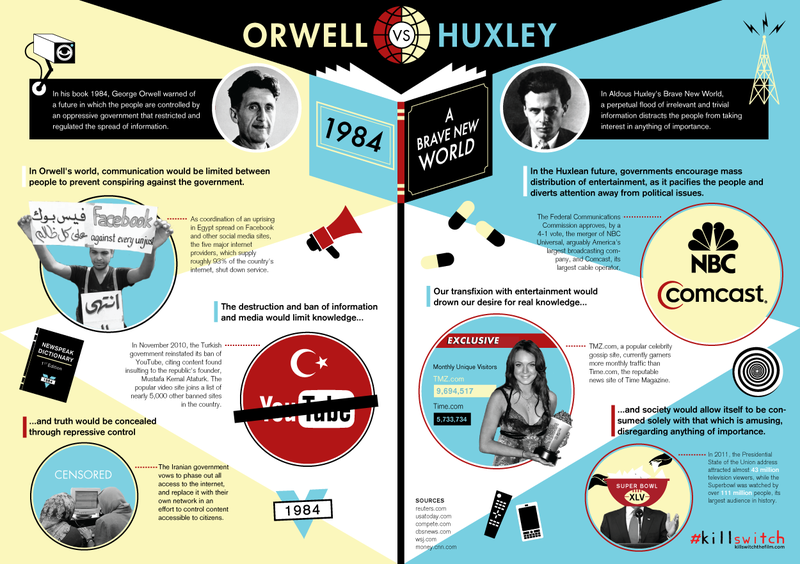 The “Huxley vs. Orwell” webcomic is based on the 1985 book Amusing Ourselves to Death: Public Discourse in the Age of Show Business, in which Neil Postman describes a contemporary America that in many ways resembles Huxley’s vision. See the article “The 30 Best Dystopian Novels of All Time” for a good introduction to many of the most popular and acclaimed dystopian novels, all of which are recommended for further reading. 1. Why do you think Huxley opens the book with a tour of a “hatchery” instead of by introducing the main characters? How does the hatchery relate to the society of the “brave new world”? 2. Describe the way this society functions. In what ways is it different from our society (in terms of the people’s values, the way they live, the organization of society, etc.)? Why do you think the author chose Ford to be the “God” of this society? 3. What methods does this society employ to ensure social stability? What is the main goal of these methods? 4. Analyze the Director and Mr. Foster’s behavior toward Lenina (Chapter 3). What does it indicate about this society? Why is the Director called just “the Director” and not given a name—what effects does this have, and how does this relate to the author’s presentation of this society? 5. How would you describe the mood and the tone of the novel, and how does the author establish this mood and tone? How is it significant in terms of interpreting the novel? Contrast the way the characters speak and the setting’s atmosphere (mood) with what you can infer about the author’s attitude toward these things (tone). The first page should give you a good indication of how the reader is supposed to react to these descriptions of this futuristic society. 1. What does the narrator suggest is the source of Bernard’s self-consciousness and dissatisfaction with society? Describe Bernard’s friend Helmholtz. How are Helmholtz’s self-consciousness and dissatisfaction with society different from Bernard’s? 2. What is the function of the Solidarity Service? Discuss the various ways in which this purpose is accomplished (the various facets of the Service). Why do you think most of the attendees react so strongly to the Service? How does Bernard react, and why? What aspects of Christianity do you recognize in the Service, and why would these things have been preserved? 4. Why is talking about the “remote past” (probably anything more than a year before) a taboo? What do you think drives the Director to unconsciously violate this taboo? What do Bernard’s initial reaction to being reprimanded, his bragging to Helmholtz, and his reaction upon learning of his impending transfer to Iceland (Part 3) show about his character? 5. Why do you think the Reservations are maintained? What is shown about the people of this society by their attitude toward and treatment of the “savages”? 6. How does the novel suggest that the average person of this society would react to being exposed to images of nature such as the ocean and the night sky (recall Lenina’s reaction when Bernard makes her look at the ocean)? Why do you think they would react this way? 1. What things do Bernard and Lenina find disturbing about the Indians’ way of life and environment? Describe some of the scenes they witness. 2. What is the significance of the steady beat of the drums used in the Indians’ ritual—why do you think drums are found in so many cultures? What similarities are there between some aspects of the Indians’ way of life and the way people in the “brave new world” live? What does this say about human nature? 3. What effect does seeing Lenina have on John, and why? Why is the expression on her face such an “amazing novelty”? 4. Why didn’t Linda escape from the Reservation? What conflicting feelings does Linda have about John, and what shows this? What “little animals” do you think Linda found in John’s hair, and why did they make her scream? 5. Describe the childhood experiences that influenced John’s personality. Why does he call his mother “Linda”? Why does he have such a peculiar way of speaking? In what important way are John and Bernard similar? 6. Why do you think Bernard is so eager to take John and Linda to London—what plan does he have? What is ironic about John’s proclamation that he is going to a “brave new world”? What foreshadowing is there in Bernard’s response to this proclamation? 1. Why does the Director consider Unorthodoxy the most heinous crime? What kinds of unorthodoxy is Bernard guilty of? 2. Describe and explain the reaction of the workers in the Decanting Room to Linda and John’s entrance. How does the Director react? 3. How does Linda react to being back in “civilization”? How does John feel about this, and what difference in values does this show—what does this indicate about John’s view of what it means to live a truly human life? Describe Dr. Shaw’s reaction to seeing her. 4. How is Bernard transformed as a result of his association with John? How is social status like soma to him? In what way are Bernard’s unorthodoxy and dissatisfaction with society more superficial than Helmholtz’s? 5. Why do you think the author chose to have John called “the Savage”? Why does John quote the Shakespeare line about the “brave new world” when he visits the lighting-set factory? What reaction does he have to what he sees there, and why? 6. What signs of racism can be seen in this society? What qualities do the people of this society seem to associate dark skin with? Ironically, what Shakespeare character does John seem to identify with, and why? 7. Describe John’s complex reaction to Lenina. Why is she confused about his feelings? Why is he afraid that she will “cease to be something he could feel himself unworthy of”? How does his behavior toward her affect her, and how does she seem to feel about him? What Shakespeare characters are they similar to, and why? What signs are there that Lenina is changing? 8. What symbolic meaning might zippers have in the novel? What do you think is the origin of the “T” symbol, and what symbolic meaning might it have? 9. What is revealed about Mustapha Mond in the passage about the research paper he decides to censor? 10. How do John and Helmholtz react to Bernard’s falling status, and how does this make Bernard feel? Describe the nature of his friendship with them. What reaction does Helmholtz have to his own “conflict with Authority”? 11. Describe Helmholtz’s reaction to Shakespeare. What does he admire about his work, and what does he dislike? What do you think he means when he says, “We need some other kind of madness and violence”? 1. After Fanny advises Lenina to go after John aggressively, where does she find the courage to follow her advice? What does this indicate about the character of people in this society? Why do you think the author includes the paragraph that begins “Twenty-two years, eight months, and four days from that moment…”? 3. Describe the Park Lane Hospital for the Dying—what the atmosphere is like, who is sent there, the appearances, attitudes, and behavior of the people there. How is Linda spending her time in the hospital? How does the nurse react to John’s distress, and why? What does the sentence “not that there were many visitors anyhow: or any reason why there should be many visitors” indicate? What does the term “second infancy” mean? What is the group of identical children doing in the hospital—what is the purpose of their visit, and what concerns does the nurse have about how John’s behavior will affect them? 4. What reaction does John have to the groups of identical workers waiting for their soma distribution, and why—what quality of this society is epitomized by them? How is his comparing them to maggots appropriate? 5. What do Miranda’s words come to mean to John (“O brave new world!”), and why does he appeal to the workers not to take the soma? What do the reactions of the Deputy Sub-Bursar and the workers indicate about why his effort is doomed to failure? According to John, in what way are the people of this society “slaves”? What does it mean to John “to be free and men”? 1. Describe Mustapha Mond. What is ironic about his being a World Controller, and how did he end up in this position? What did he give up in order to become a World Controller, and why? How does he treat these three “rebels” (John, Helmholtz, and Bernard) that is different from how they expected to be treated? 2. How does Mustapha explain the inability of the people of this society to appreciate high art? What has high art been sacrificed for, and why does it seem like a bad trade? 3. Why is it that a society of Alphas could never succeed? What evidence is there of this? 4. How is science a threat to the stability of this society? Why are technological advances kept to a minimum? What change brought about by Ford instigated the shift away from truth and beauty, and why? 5. In what way is their exile to an island actually a good thing for Bernard and Helmholtz? 6. What explanation does Mustapha Mond give for why the people of this society no longer need to believe in God? How does he explain humankind’s former need for and belief in God? 7. According to John, in what way are the people of this society are being “punished” for their “sins”? How does Mustapha respond to this argument? What arguments does Mustapha give against the value of endurance, self-denial, and chastity? Why are nobility and heroism outdated? What is “Violent Passion Surrogate,” and why do the people of this society need it? 8. What is the outcome of John and Mustapha’s discussion—what does Mustapha show John that he actually wants? 9. What is the symbolic significance of John’s chosen home—both its nature and its location? Why is the area so empty of people despite its beauty? What kind of life does he have planned for himself, and why? Discuss this in detail. 10. What happens to make John kill himself? Explain his decision. 1. In the foreword of Brave New World, Huxley says that if he were to rewrite the book, he would include a third, “sane” form of civilization as a model of his ideals. Compare and contrast the “brave new world” and the “savage” society on the reservations, and discuss what characteristics you think such a sane civilization would have. 2. To what extent has modern society evolved along the lines of the “brave new world”? Discuss examples of characteristics of our society that resemble the characteristics of the future society that Huxley envisioned. 3. Write a short story in which you try to “get into the head” of a character raised in Huxley’s dystopian society. It could be a character like Bernard or Helmholtz whose thoughts, feelings, and experiences lead him to rebel against his society, or it could be a character from that society placed in a different setting, such as a Reservation or even our own society. Show your understanding of the character’s psychology. 4. What values does Huxley seem to be championing in this novel? Critically analyze the text to demonstrate what seem to be Huxley’s judgments about various values and practices described in the novel. 5. How believable is Brave New World? Discuss those aspects you find believable as well as those that don’t seem realistic. What aspects of human nature and the nature of society suggest that it is possible for a society like that of Brave New World to come into being (e.g. the desire for comfort and pleasure, the fear of pain and suffering, the tendency to go along with the group and obey authority)? 6. Evaluate one of the characters in the novel—Bernard and John probably have the most potential for analysis, but Helmholtz and Mustapha Mond are also possibilities. Discuss the character’s psychology, his evolution/growth over the course of the story, the effect that certain major events have on him, how he compares and contrasts with other characters, how the author intends for the reader to view him, and what themes or lessons he reflects (in either a positive or negative way). 7. Discuss Huxley’s use of both insects and machines as the basis for much of the symbolism and imagery in the novel. How are they appropriate for describing the dystopian society, and what characteristics, ideas, and themes does Huxley convey through this imagery and symbolism? Be sure to refer to specific examples of their use. 8. Discuss the tone (author’s attitude) and mood (attitudes and emotions of the characters) of the novel. Where do they differ, and where are they similar? Analyze diction, syntax, and style for clues. How does Huxley employ tone and mood to convey the themes and messages of the novel? What role does irony play? Again, be sure to refer to specific examples. 9. How would you define true happiness and/or true freedom? What kind of life would one have to live to be considered truly happy and truly free? How does your definition contrast with these ideals as they are realized in the “brave new world”? Why are we dissatisfied with and disturbed by the “happiness” and “freedom” of the people in this society? 10. Discuss the issue of the importance and dignity of the individual as opposed to the importance of society as a whole. Does the meaning of life reside in the individual or in society? What view do you think Huxley intends to express through the novel—how is the “brave new world” presented in this respect? 11. Discuss the importance of individualism, freedom, and diversity in human society. What does the novel show us about why these things are important? 12. Discuss Huxley’s use of imagery and symbolism in the novel—how does he make use of these elements in relation to the novel’s themes? 13. What does the novel say about what it means to be a human being and to live a truly human life? Is happiness (even more profound happiness) necessarily the highest goal of life? © 2003-2004 C. Brantley Collins, Jr.